The Pacific island of Nauru has secured a reprieve from financial oblivion, with the promise of a loan from an Indian business group. Hiranandani Corp Worldwide (HCW), which owns commercial property across Asia, has said it will pay a Nauruan debt of 239m Australian dollars ($172m; £97m). 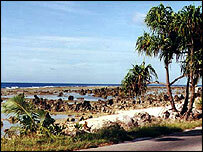 In return, it will receive the remnants of Nauru's overseas property, including hotels in Sydney and Melbourne. 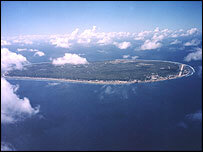 The deal, if completed, should allow Nauru to avert immediate bankruptcy. GE Capital, the US finance firm that bankrolled Nauru's property empire, called in the receivers last month and threatened foreclosure. The Hiranandani deal dovetails neatly with a recent expression of support from the Australian Government. Australia uses Nauru as a detention centre for asylum seekers, and has promised technical assistance in working out the island's finances. But it said it would not provide cash to bail out its economy. Nauru's financial woes are the result of catastrophic mismanagement of its natural resources: earnings from once-plentiful phosphate deposits have dried up, and left the islanders ill-placed to seek alternative lines of business. The island's government has toyed with various ways of raising money, including acting as a location for offshore banking - a move that has brought it into disrepute among international financial regulators. Many details of the Hiranandani deal remain to be worked out. But it seems likely to take the form of a joint venture: the Indian group will manage and restructure the properties, while Nauru will retain ownership. According to media reports, there are alternative proposals on the table. New Zealand radio reported that US investment bank Babcock & Brown had put forward a plan of its own. But Nauruan President Rene Harris has already given the Hiranandani proposal the thumbs-up. "They were quiet willing to help us and... they were fair dinkum," he told Australian media.